“Do You need a cellular booster? In the right situations, boosters DO make a huge difference and they might indeed be an appropriate fit for your setup. But they’re not always the best signal enhancing option. Boosters make the most sense for those who are relying on smartphones, tablets or devices without antenna ports. Boosters deliver the enhanced signal wirelessly, which is the only way these types of devices can get an improved signal. Directly wired antenna options often will outperform a booster in moderate signal conditions for devices that have antenna ports, as they can better Dayton Columbus Cincinnati take advantage of a core LTE technology called MIMO (multiple in, multiple out). But in fringe or weak signal areas, the extra amplification of a booster might perform better. Cellular devices without antenna ports (smartphones & tablets) then having a booster on board can be a great .. even necessary.. tool in your mobile internet arsenal. Cellular devices with antenna ports (mobile hotspot devices, routers) then having a booster on board might be worthwhile as a secondary option to try – but we recommend direct antennas as your primary solution. Getting poor signal, then trying a booster or antennas might help. Already getting a great signal & data speeds – then a booster is probably not needed, but antennas might improve things further. Will a booster work for multiple carriers or devices? 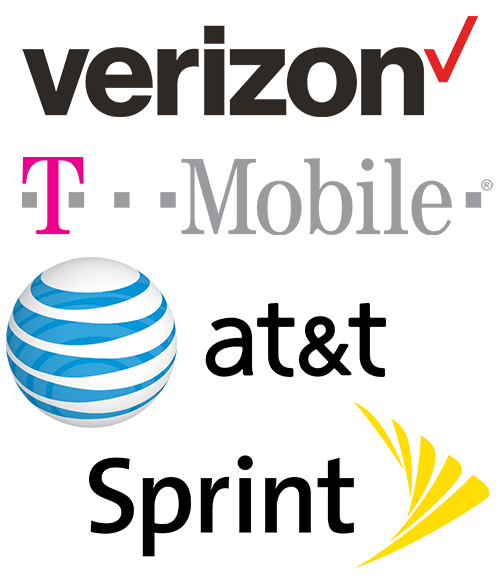 Most boosters on the market are multi-carrier compatible and will work on most 2G, 3G and 4G frequencies offered by Verizon, AT&T, and T-Mobile. But only somewhat on Sprint. They even cover some regional carriers, like US Cellular. Frequency Tips: No booster handles Sprint’s Band 41 (due to the way this spectrum works) or T-Mobile’s Band 71 (their new 600 Mhz spectrum, it’s not yet approved by the FCC for boosters). Sprint’s two remaining LTE bands (B25 and B26) aren’t directly supported by most boosters, but can benefit from some ‘spill over’ from other bands. See below for more technical info. Boosters that can handle multiple devices at a time can boost multiple carriers at a time too. A single device boosters (such as cradle style boosters) are designed for just one device at a time, but may work with multiple devices within very close proximity. However, boosting multiple devices at once tends to degrade the enhanced signal for Dayton Columbus Cincinnati each device – as they share the power of the amplifier. So for the best results for data performance, only keep one device on within the active boosted area. Boosters can be an amazing complement to your mobile internet setup, and make the difference sometimes in whether you can make a particular location work or not for your connectivity needs. Your own RV or boat’s construction (metal rigs like Airstreams and steel hulled boats can actually block signals). There’s also a good bit of confusion between cellular and Wi-Fi – they are both, after all, wireless signals. But they operate on very different frequencies. Cellular boosters are designed to only work with cellular frequencies, and can not help with getting a better Wi-Fi signal. If you’re looking to get a better connection to your campground or marina’s Wi-Fi network, you’ll need different gear (See Getting a Better Wi-Fi Signal). The confusing part is that many cellular devices can create their own Wi-Fi network Dayton Columbus Cincinnati that you connect to – so when you enhance your cellular signal your entire internet experience may improve. But you’re not actually improving the Wi-Fi signal itself with a cellular booster, just the cellular connection that your Wi-Fi network is distributing. Next PostNext Mobile Cell Phone Booster Blog ~ Can anything stop robocalls to our mobile phones?